When 11:00 a.m. arrives on a Sunday, I do what I can to be in my car and listen to "The Moth" NPR (88.7) out of LA. A few weeks ago, I caught a personal story by a man who was bright, ironic and spoke about what I feel to be true; much of what I write about in my book and blog. I'm sure it was serendipitous to hear his story. I'm a big fan of 'speaking stories', and after having the privilege of being selected to perform one of my own personal stories for a local 'speaking stories' event, I hope to do it again. It's both cathartic and exhilarating. While the storyteller's personal tale on "The Moth" was different than mine, he does speak about the significance of specific beautiful moments that make life worth living. He was close to committing suicide on a beach in Southern California when he was in his twenties. This would later bring him to pursuing a position at a suicide hotline center in NYC. Had the director known he'd attempted to take his own life, he wouldn't have been able to work there. His description of the director and the plain, no-nonsense center was amusing. His sweet sarcasm tugged at my heart. I'm also a champion of witty sarcasm. I can't help myself; it's a devoted love of smart humor. The storyteller describes how he was sitting in his car on that fateful night drinking Tequila and working up the courage to do the act. He then explains that he's not the kind of man that can drink hard without much effect. It was the fact that he got sick from being a lightweight, when it comes to drinking, that ended up saving his precious life. He got out of his car, a mess, and decided to take a last swim in the ocean to clean himself up. But he found himself immersed in the sea on a warm night with a full moon lighting his way. He was overwhelmed by the beauty that surrounded him. He was gently caressed by salty water and the sound of waves. While staring at a powerfully magnificent moon, he knew that he would never attempt suicide again. He said that life is about taking in and appreciating those extraordinary times. He added that life gets hard again, but another glorious instance comes your way making it all worth it. He repeated that a remarkably breathtaking occurrence surprises you and life is good again. I agree, and is ultimately the reason I'm writing my book and blogging. It is about moving through life with the intention of keeping our eyes open to be swept away in an exquisite experience. Embrace it, and remember the encounter so you can recall it when hardship appears to be never-ending. In the midst of a world (our country) in turmoil, and when turmoil falls upon our personal lives, it's possible to undergo a shift (however brief) when we're willing to open up. Heart-stirring observations in nature can ignite all our senses creating a feeling of being fully present and alive. A spectacular visual, sensual scent, touch; and racing heart sensations are all memorable adventures. When I set out to write, I made a promise to myself to speak raw honest words, even if it would result in risk of humiliating vulnerability, judgment, and/or criticism. In full disclosure, I've recently been in paralyzing despair. Depression is a trickster, visiting me in waves. I've surrendered and refrain from fighting the swell that overtakes me. There have been a couple personal matters that have been a hard hit to my heart. It's especially so since there was an exciting opportunity that built me up high only to have a further fall when it fell apart. I hadn't felt that elated in decades over a possibility with inspiring potential. I've been told that emotions and trauma bubble up after a life-threatening journey where survival and auto-pilot are daily companions encouraging you to put one foot in front of the other. There's good reason that the survival part of our brain takes over. What I've been through is further compounded by what I'm currently facing, and highlighting what is already an unclear path to make my way through. Now that a four-year journey, which includes the diagnosis of breast cancer, eight surgeries, and complications resulting in a brutal assault to me physically, mentally, and emotionally have passed; I'm not sure-footed or completely connected in life. The brain power to micro-manage all the details and be an advocate for myself is another sphere of exhaustion. I've been told by the professionals that emotions (PTSD) could very well catch up to me, and it has. I'm also not the same person or woman. I'm trying to figure out how to be in life again, where the flow is, where my business is after abandonment for many years, and if I will ever fit in. It becomes a vacuum of isolation and often a disconnection to the everyday activities and people when navigating life during and after cancer. Many of us meet abandonment head-on from an extended medical path few can deal with. I'm aware that I'm fortunate to be alive with a new chapter in front of me. I just need to take slow steps to investigate what that will be. Even when in the middle of the journey, everyone would tell me that I looked like the picture of health. I never let my organic warrior lifestyle go, but few know what a person goes through unless they've been there themselves. I know not many can grasp the health survival I was spinning from that deeply infiltrated my inner world. When I grew up on the island of Key Biscayne off Miami, it became a refuge of beauty for me. I lost my mother as a toddler to breast cancer, and grew up in an emotionally barren environment. Beginning when I was very young, I discovered ways to spark my heart and to feel less alone by not only hugging my cat too much, but the allure of my surroundings - A strong balmy breeze wrapping me in its velvety embrace, swimming in clear green water where I'd dive deeper like a mermaid to feel cooler water, and walking on the sugary sand at sunset when the last of the beach goers disappeared. And, of course, a full moon in Miami is indeed something to behold. 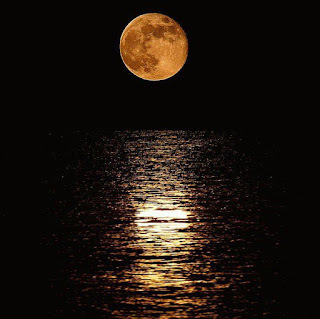 A golden full moon resting on the ocean in Miami was an enchanting visual to store in my memory bank. 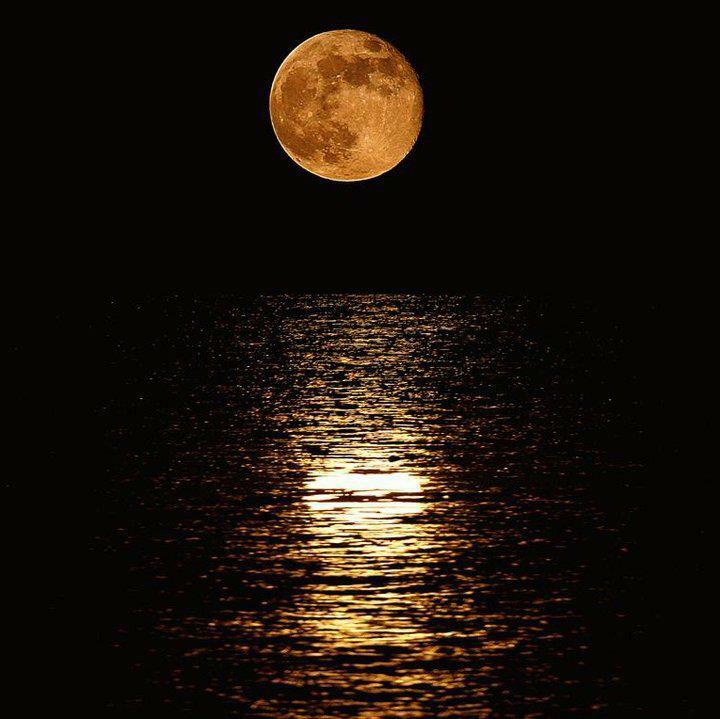 Like the storyteller on "The Moth" says, to be in or by the ocean (anywhere on the planet from my perspective) when a full moon lights your way in a shimmering glow, a hurting heart and spirit can transform into peaceful bliss. There's a full moon tomorrow, September 6th. And, my personal favorite, the harvest full moon will be resting on the pacific ocean in Santa Barbara (and glowing wherever you may be) is around the corner on October 5th. Embrace it, and marvel at its beauty. Beautiful, Val. Your writing is poignant and real. Thank you for sharing and keep swimming. Love you!